Plenty of subject experts hidden away in the dustier corners of Britain’s universities and business schools could use the media far more effectively, to raise their own profile and the brand reputation of the academic institution they work for. The problem is that they just don’t ‘get it’. That was the conclusion of a panel of senior business journalists, including Jeff Randall of Sky News and Kamal Ahmed, Business Editor of the Sunday Telegraph, at a conference this week at the Cass Business School in London. Jeff Randall said that Cass was an honourable exception to this, but most academic institutions appeared aloof or uninterested in taking the media opportunities – he asked where are the British academic superstars to compare with Americans such as Nouriel Roubini, and said it was often easier to get someone from Harvard (which has its own TV studio) to appear on his show than a professor from a UK school. They had gone through media training and were ‘ready to go’ so far as the media were concerned. Two key learning points echoed by all the panelists were: firstly – speed of response. Potential interviewees don’t always prioritise media enquiries, so by the time they have returned the call, it may be too late. BBC Radio 4 or 5-live may need someone to come on in 15 minutes – though that is the exception. Even the Sunday newspapers don’t have ‘all week’ to write their stories, many of them such as the Observer and Sunday Telegraph are part of 7-day operations with their daily counterparts, so most of their copy is written late in the week under considerable time pressure. Secondly the comms teams at these institutions too often don’t offer the right stuff to the newspapers and programmes. ‘We want people to take a view’ was the cry from the panel, not to be all ‘on the one side, on the other’. Pieces are too often pitched to the papers giving response to what has already happened, rather than taking the story on or coming up with a fresh angle. Overall, plenty of opportunities missed, and some lessons for anyone who wants to raise their profile in the media as a pundit in their area of expertise. We can now offer on-camera and autocue skills coaching for spokespeople who have to present online video material or webinars. Time to increase the diversity of your spokespeople? Media Training Associates is based in London but we can run courses in Britain or overseas, in small groups or one-on-one. Our clients range from leading banks and insurance companies to law firms, manufacturing businesses and charities. Our trainers have had experience working for BBC's 'Newsnight' and 'The Money Programme', ITN, and leading national newspapers and magazines. 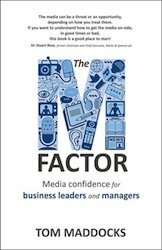 The M Factor: Media Confidence for Business Leaders and Managers, by course director Tom Maddocks, is recognised as the UK's leading media training handbook. Visit the official book website for further details. "If you want to understand how to get the media on-side, in good times or bad, this book is a good place to start" ~ Sir Stuart Rose, former chairman and chief executive of Marks & Spencer plc. © 2019 Media Training Associates.